Artists and Artisans...ZombieFest Needs You! Attention all Artists and Artisans! Do you work in the Horror Genre? Do you work in the Zombie realm? Well if so, have we got a call out for you! 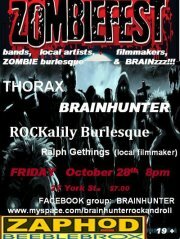 Coming Friday October 28th is Zombiefest - an event being held at Zaphod Beeblebrox here in the Byward Market and put on by the band BrainHunter. They've got an evening of all things Zombie lined up, including films, artwork and even some surprise guests. And... they'd like to offer folks with Zombie related articles a place at the merch. table. If you're interested, please contact Shareef from Brainhunter at brainhunterrulz@yahoo.ca or us at info@ottawahorror.com. We'll be posting more about Zombiefest shortly, so stay tuned!